The Digital Transformation Initiative (DTI) has assessed how digitalization in 13 major industries is transforming business and wider society. 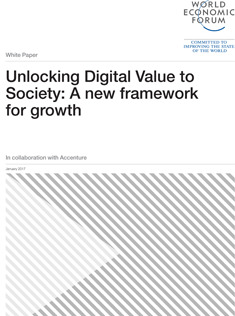 This work has brought us into direct contact with more than 1,000+ executives, policy makers and experts, who have helped uncover some key themes for ensuring the value of digitalization is captured by both business and society. To date, DTI research has confirmed that digitalization has immense potential: we estimate it could deliver around $100 trillion in value to business and society over the next decade. Barriers to its realization exist – e.g. unfit regulatory frameworks, infrastructure gaps, lack of public trust in new technologies – but if stakeholders are incentivized correctly, the vast majority of that value can be captured. Building on these findings, the initiative has identified some imperatives for business and policy leaders wanting to unlock the benefits of digitalization. The DTI’s aim now is to move beyond the research and further develop a multi-stakeholder dialogue that broadens understanding of digitalization’s implications and helps realize its benefits. 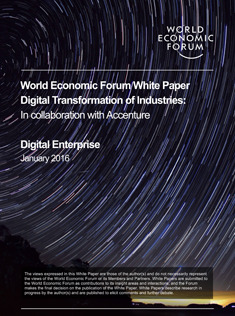 The World Economic Forum launched the Digital Transformation Initiative in 2015, in collaboration with Accenture, to maximize opportunities for businesses and society stemming from digital technologies. Customers in a digital world will be won on three fronts: experiences (versus products and services), hyper-personalization and access versus ownership. To face the future as a viable competitor, companies must make digital the backbone of their enterprise—woven into the fabric of everything they do. Narry is a trusted advisor to CEOs and their teams looking to develop and implement digital strategies and establish new ventures. He is a veteran executive—as well as a successful entrepreneur and advisor—spending two decades in Silicon Valley with experience in the fields of mobility, digital media, eCommerce, and Software-as-a-Service. Narry is based in London. The benefits of digital—from creating jobs to reducing emissions—depends on an evidence based and consistent framework to support public and private collaboration. Peter advises leaders of Fortune 500 companies, the United Nations, the European Union and public sector organizations on issues of sustainability. He specializes in strategy, with a strong focus on environmental and social sustainability, governance and ethics. Peter contributes regularly to publications such as the Financial Times and Fast Company, and co-chairs the World Economic Forum Young Global Leaders Taskforce on Circular Economy. Peter is based in London. The connected digital traveler, an equally digital automotive value chain, and driverless cars are recasting how we use transportation. By 2020, more than 90 percent of cars sold will be connected. As autos become digital hubs, OEMs are digitalizing to move from selling a product toward providing a customer-centric experience. Add to that equation Google producing a completely driverless vehicle with no steering wheel and Volvo testing self-driving cars with customers—and the world could see an infusion of $3.1T in potential societal benefits. Mark focuses on helping automotive, industrial, infrastructure and travel clients around the world develop the strategies and capabilities they need to respond to changing customer demands and market opportunities. He specializes in supply chain transformation programs across procurement, fulfillment and service management, and also leads Accenture’s C-suite theme of Competitiveness. He is based in Munich. We expect the aviation, travel and tourism industries to look completely different in less than a decade. A growing customer base in emerging markets, as well as the rise of online travel aggregators and meta-search engines, is changing the competitive landscape. As $100B migrates from established players to new entrants, leaders are acting now to make digital transformation happen at speed. Who, ultimately, will own the customer relationship as ecosystem roles blur? And how will operating models have to change? Liselotte focuses on Digital Strategy for travel clients to design a seamless travel experience, drive efficient operations and create value from new business models. This in a broader context of experience in helping clients in creating competitive growth strategies, (re)defining operating – and business models and support the transformation. She is based in Amsterdam, The Netherlands. Through 2025, digital technologies are expected to add up to $550B in cumulative economic value to the industry. From prepping the workforce to ensuring cybersecurity, joining ecosystems to launching digital businesses, industry forerunners are embracing a new digitally-based business model. Many are also closely monitoring pockets of digital disruption, including digitally accelerated biotech enabling the direct-route production of chemicals, or disintermediation by platform or marketplace players. Will the industry follow its usual evolutionary model for change? Or will disruptors force a revolution? Bernd is a managing director in Accenture Strategy, responsible for driving the Accenture Strategy service portfolio in the German speaking countries including business, function and technology strategy, digital strategies, operating model designs, organizational change and innovation. In addition, he leads our global Chemicals & Natural Resources Industry Practice where he focuses on clients globally to address strategic issues around competitiveness, digital disruption and workforce of the future. Bernd is based in Zurich. With the consumer firmly in the driver’s seat, consumer industries are having to rethink their digital value proposition. Consumer industries are dealing with a tsunami of forces simultaneously. From an aging population to Millennials entering the workforce, the Internet of Things to online consumer communities, regulatory reforms to consumers’ increased focus on responsible environmental practices, consumer companies are under the microscope. How will they deal with the scrutiny and the plethora of forces acting up on them, with billions at stake? Oliver Wright is managing director for Consumer Goods & Services (CG&S) within Accenture Strategy. His role focuses on assisting C-suite executives in the Consumer Goods & Services industry to drive better strategic outcomes. Mr. Wright has more than 20 years of consulting experience. He has helped leading CG&S companies in the areas of strategy development, growth and cost strategies, operating model architecture and technology, and the design and execution of large-scale transformations—especially supporting digital business models and capabilities. Prior to joining Accenture, Mr. Wright was a partner in Bain & Company's London office, where he acted as co-global head of the firm’s work on operating models. Mr. Wright has a degree from the London School of Economics and is an honorary fellow at the University of Oxford, Saïd Business School. He is based in London. Over the next decade, almost half (45 percent) of industry profits hinge on digital transformation. Decarbonizing and decentralizing are no small tasks. Industry leaders are slowly turning to digitalization to help them on both fronts. They are optimizing grids and asset life cycles to operate more efficiently. They are integrating customer services, using consumer data to better serve end users. And leaders are moving beyond the simple provision of electricity to living services through ventures like the connected home. Find out how countries like Singapore are leading the way. Greg specializes in helping clients transform their operating models to improve results and enable growth. With nearly three decades of consulting and management experience, he works with major utilities in North America and Europe to help refine their strategies, organizational structures, governance processes and operating capabilities. He has also worked extensively with companies in the Communications, Media, Hi-Tech and Retail industries. Greg is based in Chicago. The future of healthcare includes smart, empowered care anywhere. Retail clinics, connected virtual care and intelligent machines are just a few of the changes becoming more prevalent in the modern healthcare model. They are less drivers than collateral fallout from the two biggest shifts changing the industry: shifting the location of care out of the hospital and closer to home, and transforming care, from “diagnose and treat” to “prevent and manage.” Find out how leaders are redesigning their talent maps and exploring new ecosystems to add innovation to their portfolio. Matthew helps C-suite executives around the globe address strategic, commercial and innovation issues, grow their businesses, contain costs, and transform the healthcare community. With more than two decades of experience in building and growing teams, practices and companies across the healthcare landscape, he specializes in redesigning business models and helping organizations profitably manage their evolving customer needs. In addition, he has held CEO roles in a diverse set of healthcare start-up companies. He has held external directorships in a range of pharmaceutical, medical device, and life sciences companies. Matthew is based in San Francisco. Will logistics companies’ resistance to digital spell their doom or can they reverse the downward spiral with fast action? $1.5T is at stake in the race to build a dominant global digital platform for the logistics industry. These platforms will become increasingly important, giving small companies the global reach to compete with established giants. In an industry rife with existing inefficiencies, digital could be the savior. But the clock is ticking. Will the big players become speedy, data-driven machines who up operational efficiencies in short order? Only time will tell, but we have some predictions. Showcasing great content is no longer enough in a world where consumer experiences rule. Media purveyors are struggling to meet the needs of an ever-changing audience that demands customized content, better viewing recommendations, more personalized and relevant adverts, and online tools to recreate those “office water-cooler” conversations. Creating the right content and presenting it in the correct context will require innovation and digitization, from discovering new methods of creation (e.g. crowdsourcing) to experimenting with imaginative distribution channels (e.g. through connected retail apps). Mike Chapman is a Managing Director with Accenture Strategy, aligned to the Communications, Media and Technology industry group in North America. Mike has over 17 years of experience as a strategy consultant and serves as the global lead of Media & Entertainment and Video strategy consulting for Accenture. Mike is based out of Accenture’s Washington DC office and spends his time working with clients on both U.S. coasts, as well as internationally. Mike focuses on corporate and growth strategy, product development and operational strategy at the intersection of business and technology. Digitalization is the latest and most effective weapon of choice to battle stagnant industry growth. With $400B in value to the industry and society at stake, Mining & Metals companies must embrace digitalization. The initiatives that will have the largest impact are Integrated Platforms, Connected Worker and Remote Operations Centre, which collectively account for more than 60 percent of the value at stake. From DAQRI’s smart helmets to Metso’s sensors to assess steel quality, digitalization uptake is on the rise. John helps Metals and Mining companies develop strategies and transform their operating models to elevate their performance and be better prepared to face the multifaceted challenges of the 21st century. 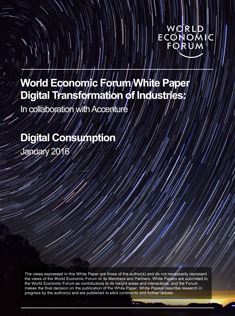 John recently co-authored the Accenture/World Economic Forum report on the Digital Transformation of the Metals and Mining Industry. Based in Boston, John is a frequent and well-known speaker at industry events around the globe on the topics of industry strategy, innovation and transformation. Energy companies can be more agile than ever now, thanks to digital technology. But are they? Overall agility does not come from incremental investments in digital technology because of the generally unsystematic nature of incremental change. If oil and gas companies instead took a revolutionary approach, making digital the backbone of their operations, they could ensure their place in the race toward the $1T digitalization is expected to bring to the industry. James focuses on business strategy development and implementation for clients across the Energy sector. James works with energy ministries to shape national energy policy, and leads major programs for national oil companies, super-majors and Independent O&G operators throughout Europe, Brazil, Russia, South Africa and the United States. James oversees Accenture’s work with the World Economic Forum on the New Energy Architecture initiative; helping governments, industry and civil society understand and navigate the energy transition. Muqsit helps Oil and Gas companies transform their strategies and operating models to elevate their performance and be better prepared to face the multifaceted energy challenges of the 21st century. He specializes in end-to-end lifecycle of unconventionals, in developing new business models for operators and service companies, and in designing and implementing large-scale transformation programs. He publishes frequently on these topics. Muqsit is based in Houston. Artificial intelligence (AI), data analytics, machine learning and platforms are driving a new approach to Professional Services. Humans and machines are negotiating a new relationship in the industry. AI supports professionals to learn, think and perform better; analytics and machine learning are revolutionizing insight generation; and platforms are disrupting traditional business models by bringing buyers and suppliers together. While the outcomes are good, the changes can be unsettling: 114,000 jobs in the legal sector alone are likely to be automated in the next 20 years. Trevor helps organizations around the world develop business strategies, offerings, innovation centers, and merger and acquisition (M&A) strategies to drive growth and high performance. He has more than three decades of experience working for Accenture, and has been responsible for strategy projects across a diverse range of industries in Japan, China, India, South Korea, ASEAN and Australia. Trevor is based in Sydney. The level of change occurring over the next 10 years in the retail industry will surpass that of the past 40. Find out how The Internet of Things, autonomous vehicles / drones, artificial intelligence / machine learning, robotics, digital traceability, 3D printing, augmented reality / virtual reality and blockchain are already changing the industry. From product design to delivery, no facet of the business will remain untouched. Chris works with leading global retailers to address the critical issues facing their businesses. A frequent speaker at retail industry conferences and contributor to major news programs, he has deep skills in the planning, design, and implementation of transformation projects with a particular focus on merchandising, benefits realization and shareholder value creation. Chris is based in London and Chicago. Better times loom for telcos as they digitalize, with more than $2 trillion in opportunity for the industry and society. The telecommunications industry ecosystem is providing the fundamental building blocks – access, interconnectivity and applications – that enable the Fourth Industrial Revolution, the digital revolution. But, they still have road to travel. A large share of potential value stemming from digitization across global industries over the next decade is dependent on the telecom industry delivering essential infrastructure, applications and productivity improvements in many areas. Greg assists clients in the Communications, Media, Entertainment, Electronics and High Tech industry segments achieve high performance through profitable growth, accelerated innovation, organizational agility and operational excellence. With more than 25 years of experience, he specializes in new digital business launches, strategic digital planning, systems integration and business process transformation. Greg is based in Dallas. James helps Communications, Media and Technology companies around the world develop and execute transformation initiatives that enable them to respond to changing customer demands and market opportunities. He focuses on the areas of customer care, operations, mergers and acquisitions, digital disruption and business strategy, and is a prolific author on topics related to supply chain and organizational performance. James is based in Atlanta. Accenture brings world-class technology and integration skills to organizations across the globe. The Digital Transformation Initiative aims to expand the understanding of digitalization’s implications on business.